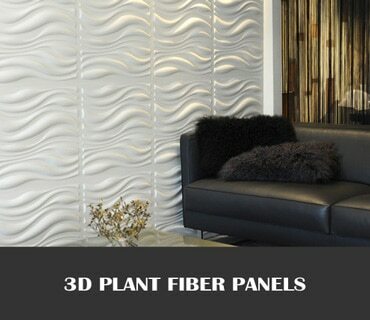 3D wall panels bring your walls to life with modern and contemporary textured wall designs. 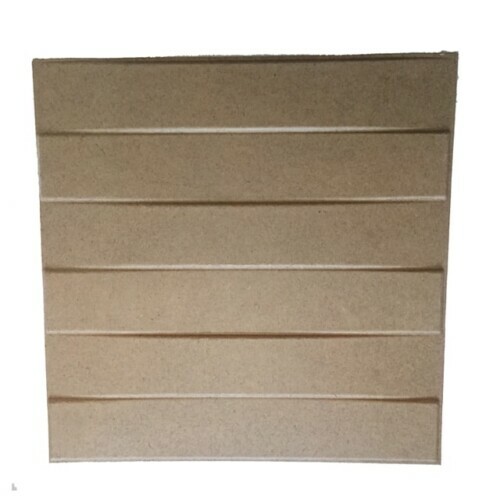 Our interior wall paneling are made from natural materials. 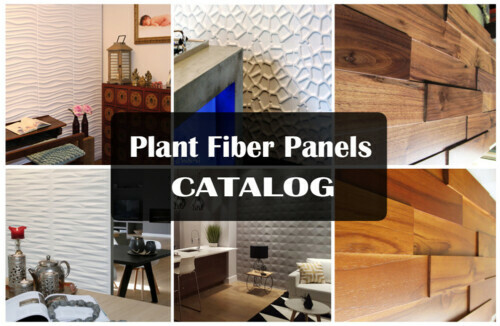 Our current selection includes Plant fiber wall paneling, MDF Wood wall panels, Mosaic real Wood paneling & thin slate stone veneer. Decorative wall panels give an extra dimension to your walls and compliment just about any room in the house. 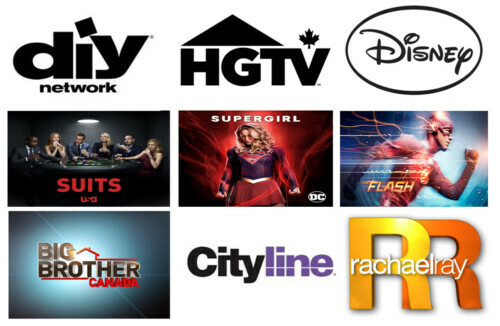 Our wall panels are used for Residential & Commercial projects: Hotels, Office lobbies, Retail outlets, Restaurants, Trade show exhibits and more. They make for beautiful and extravagant looking accent walls. 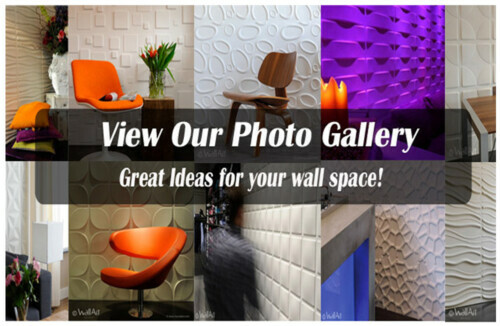 3D wall panels will bring your walls to life! 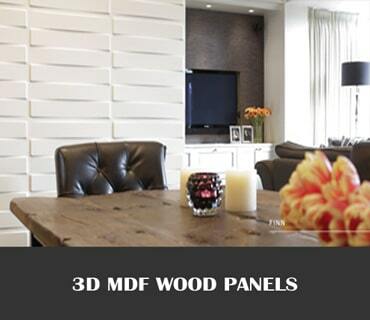 We have added 3D MDF Wood paneling and 3D Mosaic Real Wood panels made of real solid wood types to our existing original fiber 3D wall panels. 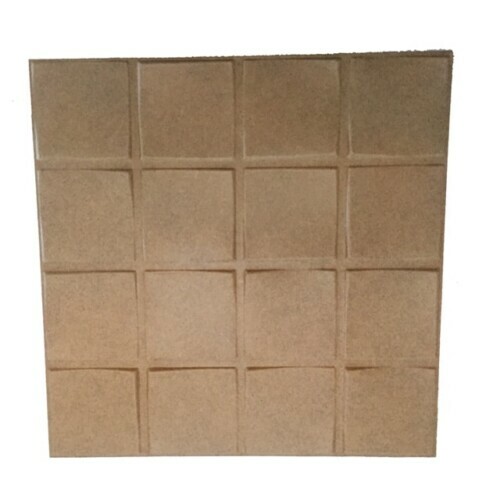 The MDF and Plant fiber panels are paintable, lightweight and all are easy to install. Decorative Wood wall paneling are very durable and we carry 12 exclusive designs to choose from. 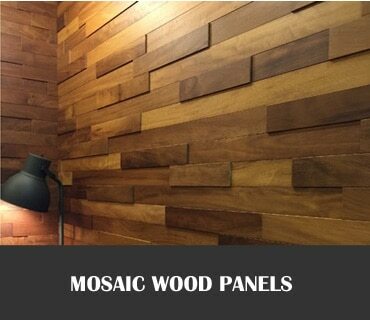 Our Mosaic wood wall panels come all prefinished and we carry Wallnut, Oak, Teak, Accacia and Ash. 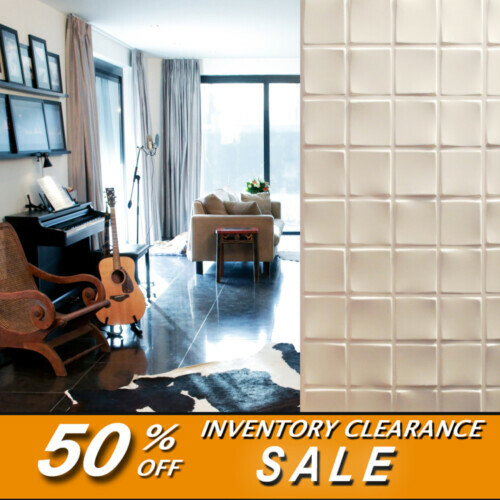 They provide a rich extravagant touch to your interior wall space at a very affordable price. 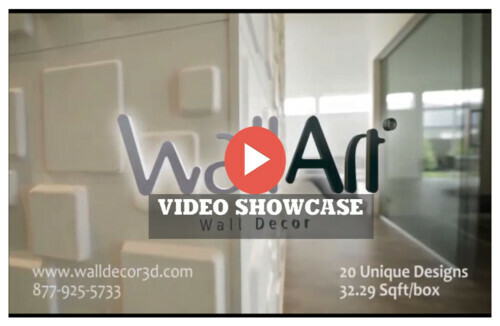 WallArt 3D wall panels were featured on the hit DIY Network show “I Want That” and made the Top 15 product of the year. Check out the video and see the transformation take place along with how easy they are to install. Awesome product! Used in a dental office. added them to my bedroom. everyine that saw it was asking where I got them from and, how I did it. I was able to cut them easliy with a utility knife but, I woukd suggest a small oscillating saw to get exact cuts. Absolutely great product and amazing customer service! Will buy from again! The panels are so easy to install and makes a huge difference in the entryway of my new office. Great product and 5 star service! The custom service was above and beyond and the product arrived SO quickly after they expedited the shipping to help us meet a deadline. The product looked beautiful after installation and our client is thrilled. Thank you!! We are very pleased with the product, delivery was very timely, it is easily installed and the result is a beautiful wall. We were looking for something different for our family room and this product most certainly fit the bill. We would most definitely use this product again. LOVE LOVE LOVE it. We get so many compliments on our wood wall. This has been one of the best and easiest upgrades to our bedroom. It was so easy to install and it completely transformed the bedroom. We could not be happier with this product. Quality, communication, and shipping are all top notch. Thank you! I have a picture to share! This is an elegant design feature for any home. Used the teak panels behind a free standing soaking tub in our bathroom. It created a high design focal point that has elevated our bathroom to a spa like look. The panels are not heavy (actually lighter than I thought), but the wood grain and varied depths of the pieces gives a lot of visual interest. I can not speak to application because our contractor installed. We are going to use this on our first floor to bring design uniformity to our home. OMG just had mine installed today 3 days before Christmas. What a gift of pure beauty. My contractor took his time and created a Masterpiece. Design and ease of install is great! We used these as an added wall feature in Our small Spa rooms as wall decor and staff and Guests are raving about them! Will definitely buy again for other home projects as well! The Waves panels put an end to a problem wall. It brought an upscale look to our basement’s spa. We installed these in my husband’s home office and they give it a great look. Panels do feel like a stiff cardboard and I would caution against placing anything heavy on them as I feel they would deform or rip with enough force, but as a decorative wall piece, it works. 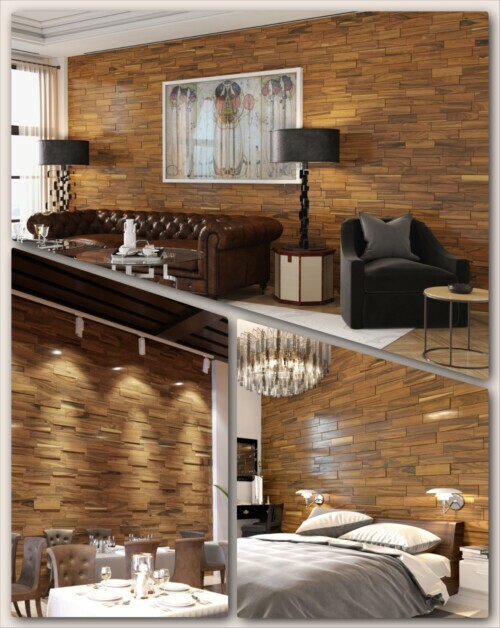 These wood wall panels are stunning and add so much character to my room. They are durable and easy to place. Thank you for this awesome product! I am very satisfied with these panels! I love working with these panels. This is the 2nd project I have done and this design is so easy to work with. There really is no pattern due to the seam design. Super easy application. We opted for 0 wait time power grab adhesive and it worked amazing. Highly suggest this adhesive. I really can’t say enough about this vendor as well. Awesome customer service!!! Look forward to working with Carm in the future. Thank you for all your help. These panels are amazing! I was originally going to go with a more basic design but wanted more texture so went with the Cullinans design, & I’m glad I did! They came in the mail super fast, & came in EXCELLENT condition. I remodel houses regularly & ive always used ceramic tiles for my feature walls, this was my first time using these panels & the process was way easier. Once you get in a groove they go up seamlessly, 5* on these tiles, I will definitely buy again in the future. Great Design look for my Bedroom and Den upstairs. I will purchase more Designs for the future. Amazing to work with and adds a great contemporary look to our home!! As a contractor, I recently installed another brand made of fiber and gypsum for a customer. Material cost for a 10″x10″ wall was $2300.00.Your product used in my home was $120.00 for a slightly smaller area. Your product is so much eaiser to install and no sanding. Easy to work with and looks as good as hers. I have it lit to show off thew texture. Thanks for a great product! Very nice looking and easy to work with product. I recommend everybody. Remember you need to paint it to make it even more nice and durable so include that time to you project. I installed these on a wall in my livingroom behind my tv in a few hours. Very easy to apply.. a little tricky to cut around outlets. I used white spray expanding foam to fill in gaps around cuts since the outlet frames didn’t work for me. The wall looks stunning! I get lots of compliments on it. Looks very high end. I love it!!! I’m planning on ordering a different pattern for my media room soon! The product is good and installed easily. The customer service is good. The only problem is limited inventory. We were not covering a very large space and had to change the species. They still didn’t have quite enoug without waiting on back order. We changed the layout to fit the quantity we had. We designed and built our dream home and it is mid-century modern inspired. After looking high and low for a medium to cover our fireplace wall I came across these fabulous panels. We receive countless compliments on the wall after painting them orange and installing our electric fireplace. Excellent looking and easy installation. Also, well engineered. We installed in a large wall of our leaving room, and in a corner of our kitchen and in one bathroom wall and looks really classy. In total I have installed 200 panels so far (we are ordering more for another bathroom), and I have only seen one of them damaged, and with just a slight dent in one of the woods. This is to me the best proof of quality for this product. Also, dealing with Wall Decor3D people has been a pleasure. We will keep this company on our list for home remodeling from now on. Love these panels. These panels were reasonably priced and easy to apply on wall. The best decision I ever made. 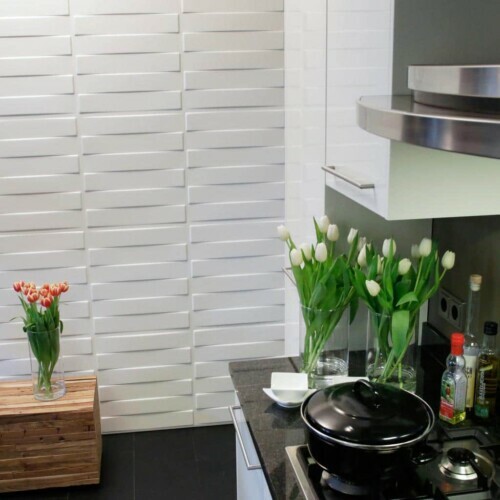 First these wall tiles are great – we love them. The customer service is also excellent. One word of caution – these tiles really must be painted using a sprayer. We brushed them and were very careful to not go over a spot several times and the wood bubbles for frays – especially around the curves. We would still purchase them again and did an entire top half of a room – they look great but we definitely would change our painting technique in the future. We are very pleased with our Caro design wall decor. It is very nice and many people have liked it. The wall decor is pewter grey with Light Grey above.My husband installeed and painted it quite easily. We would recommend the product. Our Living Room has not been done since the 70″s in an 108 year old house. This was installed over and painted wallpaper. We are very pleased with our Living Room decorated with Caro Wall Panels. It turned out really well and many people have liked it. The top above the panelling is Light Grey and the wall decor is painted Pewter Grey with white trim. I would send a photo but don’t see where to do that. The wall look real nice, like the services. Quick response and fast shipping. Definitely will be getting back for more order. Thank you very much! Very happy customer. I am thrilled with how my wall turned out. It was a bigger project than I anticipated. It took four long days but the result is worth it. The most difficult part is cutting through the tiles for around outlets and such. I used a utility knife which was arguos work. I would suggest a power saw if you have access to one. Also, I suggest a power spray painter rather than a brush or roller. I picked one up at Home Depot for $80 and it was well worth it. I then did a roller faux finish on the raised surface. Lastly, if you are working with a flat (non textured) wall, the spacers aren’t necessary. Admittedly, it was a fun project. I will work on another room soon. We purchased 3 boxes of these panels for a big conference at our church. They were used in our stage design with uplights on them and they looked amazing. SUPER happy with them. We installed them as a temporary installment so they can be reused later. The Senna 3D panels worked out great! I did have to use a table saw to cut them. I put them on the back of my island and they look so cool! Very happy with service, quick shipping and love the design. Can’t wait to install them. Thanks! Installed perfectly and looks great! One of the panels had a small scratch across the front but I ended up having 2 extra panels after the install so I was able to avoid using the scratched piece. It’s so awesome looking and everyone that sees it comments on how cool it looks! Excellent quality. Perfect for our renovation idea. Love it. Until now, I can’t believe that my husband and I have converted our bedroom into a hotel room! Easy to install with PL adhesive and some finishing nails. Beautiful in white paint. We used oil-based primer, then water-based final white paint. Won’t show any signs that a non-painter painted them! Love my wall! Incredible impact to any room. We used them in a large lobby with multicolored led lights (dmx fixtures) that highlight the multidimensional design. Dramatic upgrade to a mundane wall. This is an excellent product and easy to install. I installed it on one wall where my TV was placed, as an accent wall. It looks really good. I would recommend this product to anyone who wants to improve the look of their home. Worried a bit that they won’t be sturdy enough since it’s just as thick as carton compared to the MDF I previously ordered. But hell no, it was stiff enough in my washroom wall (guest washroom only. No bathing, hence, no heavy moist). I couldn’t agree more, it gave my washroom a ‘hotel-feel’. You can’t dent it when you try to poke it when installed (that was my initial worry). Will purchase again for a new design for my daughter’s bedroom. My wife finally agreed to let me redo our living room after two years of begging!! After she saw the final results, she fell completely in love, and enjoys the reactions our friends make when they enter. Love it!! The wall panels were an extremely good buy. The panels added so much style and Gave my living room a whole new look. I am looking forward to working on my Next 3d wall panel project. Great idea as a wall covering. Easy, light, and not messy for a DIY project. Attractive, modern and calming to look at. I highly recommend. Easy product to work with and makes a boring wall exciting. Quick shipping, easy to work with. Very happy customer and end result! Looks Great, panels were pretty easy to work with. Envío rápido, en perfectas condiciones llego el paquete, fácil de instalar y variedad de estilos puedes hacerle a tu decoración,,, 100% recomendado. Good product… good service. I just installed an accent wall and the teak is beautiful. The 3D effect and beauty is definitely enhanced when lighting via recessed “dimable” ceiling spots along the wall.. Mine are 12″ out, spaced at 24″. Perfect! Only concern relates to how the panels are packaged. I had two panels that had cracked “bricks” from shipping/handling no doubt. Need to secure panels in the box better… Good Luck WD3D! Looks great ! Panels are lightweight and easy to install. Order arrived quickly. I am a General Contractor we were looking for a unique product to put on the outside of a wine cellar, this product worked perfectly. 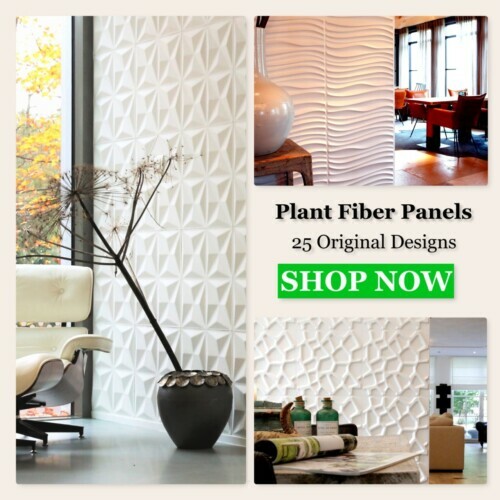 The Decor3D wall panels are very high quality, the ordering process was easy , and delivery was very fast. I would use this product again on my future projects, the walls look unbelieveable. Finally, the product was easy to use also ! Love them – look fabulous in my office!! The wall panel are stunning and are one of the first things our friends comment on when looking at our remodel. So glad that we found this product. Customer service is superb ! Five stars from me! We bought the panels for our showroom. They are beautiful and our customers compliment us! 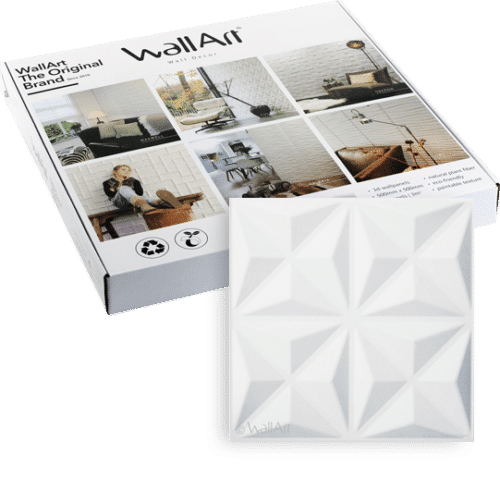 Great product and service from WallDecor3D. The panels all fit together nicely and our fireplace wall turned out great! I used exactly the number of pieces we calculated and had virtually little waste. I would definitely recommend this product and this company to others. 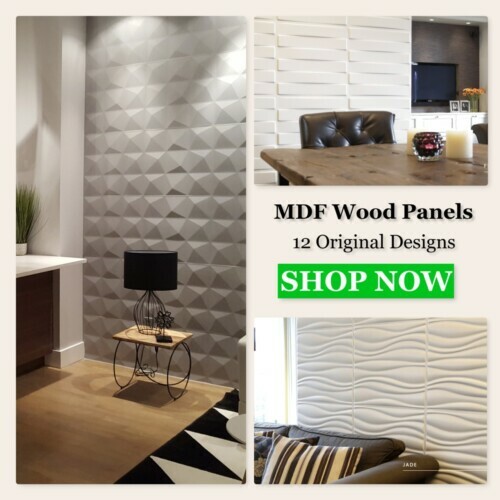 These panels are an excellent product and easy to work with, delivery happened very fast without delay, the product quality is beyond what I expected and the Finished product came out beautifully. The customer service I received from the company was Remarkable and caring, these folks really provide a great product matched by a first class customer service. Love the product. Easy to use but the tool on the website to determine how many panels you will need isn’t accurate. It is if you use everything you cut off and piece it together but you screw up the pattern of the wall doing that. I learned the hard way and had to order 2 extra pieces and got caught paying shipping for that mistake. Otherwise it was worth it. Beautiful accent on my space! Very efficient customer service and shipping. Nice Product Good looking, and good quality. Great, beautiful, well-engineered, easy to install. The product was very simple to install and easy I cut. I made a few err or a but is was a very forgiving product, that my errors are hardly noticeable. Love it and would use again. Great product and service! Wall Decor3D helped to expedite shipping so my project could be completed on time. End result was a beautiful feature wall on either side of a built-in banquet! Will be buying from Wall Decor3D again! Great stuff! Thanks again. This product looks great and with care, installs quickly and easily. My main caution is to use an electric cutting tool as opposed to using a utility knife, will help for straighter cuts and then sand down edges for smoother finish. Panels look great on wall. They look really cool. We painted them grey and installed on an accent wall. We get s lot of compliments. The look is amazing! Installation and cutting was very easy. Looks wonderful and warm as only wood can be. Finish is very nice. Would be great to hear some advice on dusting the panels once mounted – lots of small ledges that will accumulate dust over time. Be prepared to cut a lot of pieces when abutting on the side to cover the ladder pattern and perhaps order a couple of spare panels for the sake of little pieces you’ll need to cut off an fit. I have a boxed-in surface and starting from the left side was easy – cutting the panels even with a bench saw. On the right side panels just reached the wall and I have now to cut and fit pieces and glue those to cover the ladder pattern on the right. Maybe I should have cut on the left differently to simplify, too late now. Get some white carpenters glue handy as some individual boards may peel off while you are cutting or flexing the panels, too. Just finished installing and painting the panels. So easy to install, anyone can do it. It looks so nice. Gives a high end look but at a very low cost. The only complaint I have is that I had about 6 panels that had bent corners. Luckily I had a few extra and did not have to use them. I will definitely be using this product again in other areas of my home. Great Quality. Installation is easy, although time consuming. Looks incredible and would definitely purchase again. Very fast shipping, nice package, easy to install and light weight, I love it. My bedroom is very stylish and modern with these awesome panels. Thank you very much! Good quality. Installation was intimidating initially but once we got going it wasn’t too bad. Take your time. We also figured out after using a utility knife to cut the tiles, a band saw works well for cutting the plant fiber tiles too. Used paintable caulk to seal the seams, but doesn’t sand very well. Still working on the finishing stages but happy with tiles overall and would purchase them again. Great product and installation was simple, easy to cut to measurements. Looking to buy more for other locations around my house. Great customer service (even over a holiday) and speedy delivery! Looked great, was easy to fire proof by adding flamex SF to the panels to use for a trade show. Ready to use them again and add paint! High quality…easy to install…looks great!!!! We love our new feature wall. The panels were easy to install and it looks great! We have been showing it off to everyone that walks into our house. The only suggestion I have is to package the panels better. When we received our orders many of the boxes were tore open and damaged from shipping. The panels survived and were luckily undamaged however. Panels are really beautiful. Happy with the result. The ordering estimate table, ordering process, delivery estimates, delivery and packaging were all excellent. We found that while some of the pieces fit like a glove, some of them were out about a 1/16″ and slowed the installation process a little. By the end, we were joking that the ones that fit like a glove were the Monday morning product and those that were being difficult were manufactured on Friday afternoon. The end product was all worth it as we did and 40′ elevated pony wall with 4 different angle portions in about 8 hours with 2 people, one of whom knew what he was doing. It looks fantastic and positive comments are being received daily. Installed nicely in our retail store as a feature wall. Very pleased with the results! Love It!!! Looks so ELEGANT!!! Beautiful. Absolutly love this product! The customer service was excellent, answered all my questions very quickly. Speedy shipping, had it in less than 5 days. And easy installation. We used this product to cover a support beam, and once we painted it, it made it look so rich and elegant. We are now looking for other places to use it again. Much cheaper than buying tile, or even ceiling tin! Great Experience all around! Beautiful accent to our massage suite. Everyone loves the dramatic effect. I love the effect in my bathroom and everyone who sees it loves it. Great customer service. I called them because I needed two extra tiles and they only sell a 10 pack of the tile I needed. They called me back next day and sent them to me. Will definitely use for other projects I have in mind! They look fabulous! Very easy to install, without mess, very easy to paint, and it gives the room a different view. I absolutely love it! I may be an idiot but I put these outside on my front fence !!!!! first I took and I painted the lines the same color of my home ( to bring out the 3d look a lot more ) then I put three coats of polyurethane, and they look great !!! how long will they last ? don.t know but it has rained out a few times now and they still look great !! I will keep u informed in time to come ! Good materials. Numerous designs to choose from. Great customer service. Looked good on our wall, great price and so much easy to install than theplant fiber type. It was easy to install, and more solid material than anticipated. Great product and awesome service. Carm Costa was very helpful. Highly recommended! Everyone who comes to the office loves the panel on the future wall. Thank you !! Great product!! Looks exactly like it does in the picture. I’m in love with my wall!! I don’t usually write reviews but this product deserves a thumbs up!! Would definitely buy again!! I actually order samples first, after talking to the sales rep and he was very informative on the subject of how to install the product and I had previously bought PL construction adhesive 3x, I returned one because the glue did no adhere to the panels very well, I will be finishing my product with another adhesive from gorrilla. I can’t wait to see the walls comes to life with a small led lighting kit. Great quality , as advertised . Easy install, overall very happy with purchase. Will definely purchace more in the future. Beautifully Covered over a wall of ugly old flocked wallpaper that was fifty years dried on and impossible to remove! Looks very sophisticated. Love these tiles! Once you find the right tool to cut them with it is a breeze, My utility knife was not sharp enough so I used a heavy duty pair of metal cutting scissors. I primed and painted the tiles a royal blue and it looks awesome! I am getting more to do the back of another built in! Product is as advertised – we had very exact dimensions, took our time measuring and leveling, and followed the installation instructions explicitly for results that truly lived up to expectations. Painted over them with a high-gloss metallic primer for an amazing, modern look-and-feel. Very easy to work wish. So unique and cool looking. Using in my Med Spa these are easy to install and make a significant impact. I needed to return several boxes and this company was fast and supportive in process. Will order again in future. I am in love with this product. Shipped on time and the product quality the best. It was easy to install and final result amazing. Ready to order for another wall in the house. Love my new wall, it was a fun project and looks so elegant. Excellent product easy to install affordable price u can’t ask for more!!! Great wall panels! Look great! Only thing to improve them would be if they came ready primed for paint! I love my feature wall. The guys I had put it said it was a great product and easy to work with. The finished product is beautiful..
Love these wall panels. I created a beautiful feature wall in my dining room with the Maxwell panels. Definitely a statement peice. Thank you wall decor for the great quality panels and awesome customer service. I’m looking forward to ordering again for another project. These panels are excellent!! Came in time. They are thick and strong. Needed a good knife cutter to cut in the edges. I used Heavy Duty Liquid Nail to stick them on the wall. It is a lot of work but really worth it!! I primed them and then painted them glossy white. The results were stunning!! Excellent product and amazing results. The look of the Maxwell is both contemporary and classy. Love the product. My husband and I installed it and the whole process did take quite a bit of time but it was worth it. Our statement wall looks fantastic. I installed the panels using “No more Nails” for paneling and moulding. I did a floating installation and it looks awesome. Would definitely buy again. If you are not skilled with a caulking gun, I suggest you find someone who is and let them perform the task for best finished results. I covered an accent wall in the waiting room of my surgical clinic with the black walnut surface. Since we did not have a huge tear down, we had to match Walnut in our doors and trim. The product came quickly in the mail, was easy to install by a standard construction crew, and looks great without breaking our fledgling budget. It works well with the black walnut that was already in the space. I did decide to trim the corners and edges rather than miter them as I had been recommended by the company and this has worked out well for us. High marks to WallDecour3D! Product is great & customer service as well. I would recommend these products to anyone looking for a feature wall. What a difference in our small living room was made when we looked at this great product! It was so easy to install and my husband was very pleased. We have family and friends coming by just to see our new Wall Art. Thanks for a wonderful product! Excellent look at our hotel front desk area. Thanks! Wonderful results! They paint very easily and installation simple. They Give the room a great feel. Used the panels to cover existing tile which would have been difficult to remove. Great product! Also used extra panels to attach to a blank canvas and hung on opposing wall with an awesome look. They look fabulous. They went on the wall easily . I will buy it again in the future. We have a friend who installed these, and were interested as there was one wall in our basement we wanted to spice up. All I can say is WOW. It is now a feature piece and was very easy to install. I suggest using a level to get the first tiles right, and then with an applicant like “No more nails” just spread the glue throughout the back, and place small dabs of glue on each corner and edges (be careful not to put to much). Literally takes minutes to install and there’s instant gratification. Excellent quality product. I’d recommend it anytime. I have been trying to locate this type of product for years. Totally impresses with it. It was used to cover damaged interior doors, allowing for 3D interest. Paintable, light and impressive. Thank you. Absolutely stunning. I used these on a play production set. Easy to use. Easy to paint. HIGH impact. I so happy I made this purchase. The turn around time was perfect. It is easy to install. We painted ours a glossy white and panel still look wonderful. I highly recommend and I will be submitting our picture. Product is fantastic & customer service is wonderful! Panels look great – for the price you can’t go wrong. Actually purchased a sample to get an idea of how they looked first. The panels were great and way cheaper than other options we were considering. I don’t usually leave reviews but I am a fan of these. They look very modern. The product is very nice. Packaging and shipping is very professional. Installation instructions are very clear. Thanks! Very happy with the wall art tiles. They have made our home entry way perfect. Very easy to install! We even painted them a gloss white to make it pop more on our feature wall and it looks like a very expensive product. We get complements all the time and even had a client ask about installing it in their home too! This product is very easy to install and looks great. A great room changer. Only downfall is having to use oil based primer. 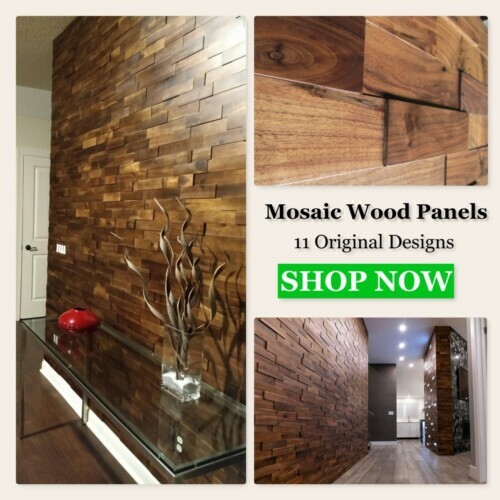 These wall panels look amzing.. i have received many many compliments on how they look and asked where’d I get them. I will be purchasing more soon to do another room. Product was beautiful as advertised and arrived on time. This was use to cover a wall that had wallpaper removed, and I did not want to prep the wall. It looks great, and was easy to install. Outstanding experience working with Carm! The product deliveries were always right on time. I needed 8 boxes of the Kite Design for my television show background. I hired a professional to complete the installation and it is a masterpiece. Install was easy. I absolutely love my new background….Thank you Wall Décor 3D for your affordable and high quality products. It’s all about your creativity. I will order again in the near future. Speedy shipping, easy to install. Great help and prompt replies. Hardest part was figuring out the of color paint to use! They look fabulous! We painted them a metallic silver and it serves well as an accent wall! Love the product. We installed the 3D wall in the bedroom and it looks amazing. The instructions are easy to follow. Take your time and follow the steps. The end result is worth the time. Quick and easy. Absolutely love them! Such a unique look for an affordable price. These panels came faster than promised and in perfect condition. They are very precisely made. I gold leafed some of the shapes and they came out amazing! Thank you for such an affordable beautiful wall treatment! I will be back for more! The wall panels are wonderful and just as promised. I spray painted mine and used 3M double sided tape (to hold 15 pounds) to adhere to the wall. I was able to match and align them almost to perfection, but in one area I used the same spray paint to touch up a slight gap. Worked perfectly. I used the panels on wall in my psychotherapy office and everyone loves it. Planning my next wall panel project for my home. These panels have been great. Finish is nice and smooth. Panels are very square, installation went very well. I used liquid nails for paneling to install with good results. Don’t stick painters tape to these it will peel up a bit of the panel. Looks great, no problems. Eye catching designs that draw a lot of compliments! This is the second time I’ve used this product and it’s really great to work with it but especially rewarding when you see the results. Everyone that sees these panels love them. The panels are easy to install and go up quickly. They really look great once caulked and sprayed. It looks very nice and great effect for accent wall. I do have a tip that you might find useful if you don’t want to put the panels up permanently, I used the velcro “Large Picture Hanging Strips” which each hold 16 pounds and command strips. I tested this for months with a couple of panels and they never came off the wall. Once I’m ready to remove them, it will be easy to take them off and not damage the wall at all. Also, I painted each panel before I put them up. I think this is easier than painting a wall of panels. I think they will look great. Very unique. I bought these panels for a commercial application. They arrived on time and in excellent condition. My dining room looks awesomely elegant! I originally thought to put these panels in my hallway… So glad I went this way. Panels arrived neatly packaged. Relatively easy to install, make sure you have plenty of adhesive before you start. I used around 4 tubes for a 8 x8 wall. I haven’t painted them yet…. Phase 2. Happy with my purchase. As shown in the picture, good quality. delivery was fast. Highly recommended. Love it. Everybody at home love it. Was happy to receive my order of square panels. They went on the wall easily and the end result was just, wow! 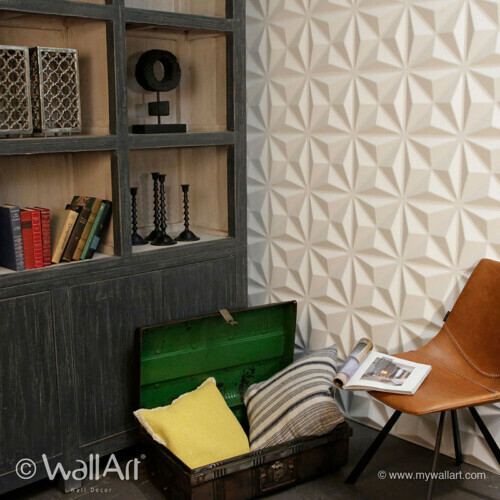 I’m hooked on these 3D wall panels now! The panels are more sturdy/rigid than I expected, which is a good thing. I was expecting them to be more susceptible to damage, but they seem like they will hold up to the wear and tear of family life. The seams were a little more noticeable than I expected – even after multiple applications of putty and sanding prior to paint. The final product adds a great and unique design element to our room. easy to work with fabulous results! The panels are good quality. The scalloped sides of the panels had to be primed and sanded several times to remove rough MDF texture. Once sanded, primed and painted, the panels look great. We used the panels to make door fronts, adhering them to 3/4″ MDF with “No More Nails” adhesive. beautiful…easy to install with finish nailer…instant gratification!! Absolutely gorgeous! Had them installed for us – we are renovating so left it to the pros. It looks better than I imagined. Wish I could attach a picture to this review so you could see for yourself! Used as a feature wall in our dining room – the space is open concept so you can see (and enjoy) them for the living room and kitchen as well. I couldn’t be happier with the quality and the beauty they added to my space. I have never used the non mdf products they offer for comparison. So, the installation video doesn’t represent this product very well. As a novice woodworker I had a difficult time cutting the panels to fit our crooked walls. I ruined more than a few panels during the learning curve. Plan quite a bit of time to get a nice finished product. However, that has nothing to do with this excellent product. The panels were very smooth and easy to apply a paint finish. If you like the look of these products go for it! You will not be dissatisfied. I thought this would have more of a plastic look. It doesn’t, it looks more like a heavy duty cardboard seeing it from the back. That was not an issue. It was strong and paint stuck to it well. Much easier to measure and cut than expected. I was able to cut the waves precisely using a sharp pencil, straight edge, and my Rigid oscillating multi-tool. I was very pleased with the end result. My wife loves her new wall and so do I. I would be happy to post a picture if they had that option. Pretty simple to mount, fallow video instructions. I recommend putting a aluminum Schulter strip on edges, looks really nice! Looks beautiful, took longer to install and paint than I thought but the end product was nice. Very nice product when all painted, very easy to install. Wow. It looks so nice and elegant. Easy to install. Love it. The panels went up easily, not to difficult to cut very happy with the end result. they look great,really made the wall stand out and easy to install. Install is easy when you don’t have to make cuts. Had to buy a skillsaw to cut them down to fit an inside wall. You have to go slow and be neat otherwise you will make a complete mess of these with the glue and caulking. Easy to install yes but the finesse is in the finish work. Very pleased in the quality of the product. Was simple to put up and looked amazing afterward. Awesome product! Gives so much character to accent walls. My office is a hit because of it. The panels were easy to install and light to handle. We didn’t bother using transition trim, in between the squares, but put an oversized frame around the wall that measures 7′ x 14.’ It looks stunning and many are asking where it came from and what it is made of. We didn’t paint it because I like the natural colour, but maybe in a few years. I love this product. Is very easy to installed the finishes look beautiful. Look cool upon examining but havent had a chance to install yet. Cant wait to see end result! Hello, This product looks great. The installation was easier than expected. We installed in our company’s lobby, using 6 cases. The entire installation was completed in a few hours. The product is dimensionally very good no problem with a large area. We Obsoletely love it. Best purchase ever it made our basement look very modern. I like the lightweight quality of these panels, the wide choice of selection and the ease of putting them together. They are stunning on the wall and make quite the statement. I put mine on a frame first then hung it between 2 sconces which really set the entire piece off. Was bit shocked at shipping costs but wanted the panels. Thanks they look great! I installed these myself in one day using contact cement. The panels are not finished (still need to be filled/painted) but I’ve already received compliments and they look great.